George Washington Parke Custis (April 30, 1781 - October 10, 1857) was an American writer, orator, and agricultural reformer. He was the grandson of Martha Washington through her first husband, John Parke Custis. When his father died in 1781, George Washington Park Custis was raised at Mount Vernon by George and Martha Washington as their own son. 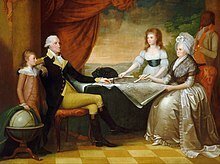 In 1804, Custis married Mary Lee Fitzhugh. They had four children. Only one, Mary Anna Randolph Custis, survived. In 1818, Custis completed Arlington House in Alexandria, Virginia. He displayed a large number of Mount Vernon relics there. In 1831, his daughter married Lt. Robert E. Lee. The two remained in Arlington House. They had 7 children. Lee helped Custis manage his business affairs. Custis died in his bedroom at Arlington House in 1857. This page was last changed on 19 March 2018, at 20:40.